Well, as usual, your feedback on yesterday’s post about Johnnie’s feelings towards other dogs was really awesome. I hope anyone who is reading this and has a reactive dog – at whatever level – realizes your dog is not the only one, and in fact there are so, so many dog owners out there dealing with the same thing you are! Johnnie is really not that bad in terms of reactivity, but she has her struggles and it feels so great to hear everyone’s own stories. Just last night I posed a question on our PLF Facebook page about taking Johnnie to the vet while we’re still working on ourselves, and so many of you responded with fantastic advice almost immediately! At the end of yesterday’s post I mentioned that I finally scheduled a playdate for Johnnie. Often times a really good off-leash romp with another dog can alleviate some of the frustrations your dog is feeling around other pups. 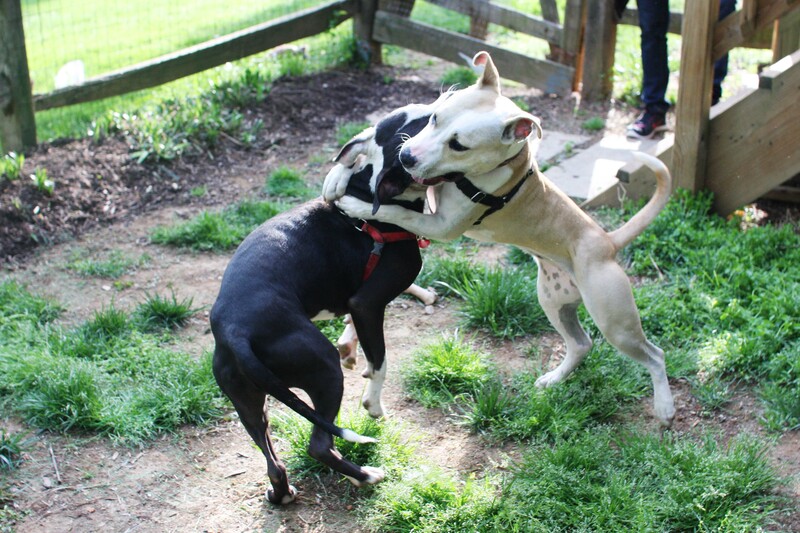 These should of course be well-supervised and held between dogs with similar play styles, and I always recommend reading up on dog behavior and appropriate play so you’re versed in recognizing behavior or body language that might be a red flag. Many of you guessed correctly: our playdate was with Charlie! Charlie has stayed with us and therefore been featured on the blog twice, once as a Jasmine’s House foster dog and once as an adopted dog after his foster family foster failed! He’s a total doll. He was sick for a long time, but since I last saw him he has gained about ten pounds and his coat looks phenomenal. He looks like a different dog, really. 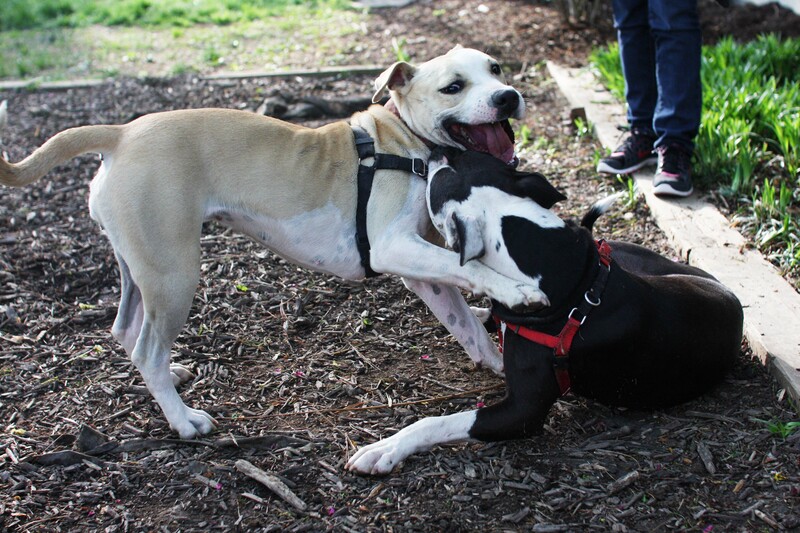 By the Sunday afternoon when we had the playdate, Johnnie had already succeeded in a few challenging situations with other dogs. 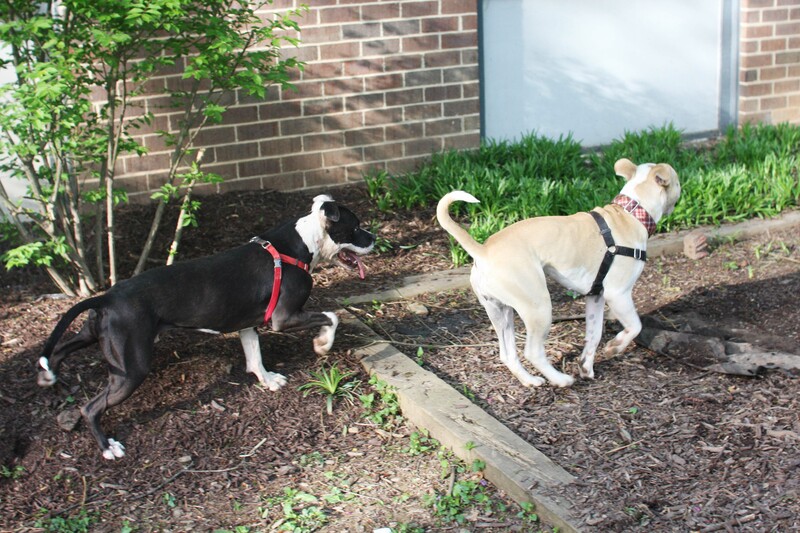 Two that I mentioned yesterday – playing with the puppy and doing well during the adoption event – and then Sunday morning she met an off-leash dog while we were walking in the woods. I had noticed the dog with his person a couple hundred yards behind us, made note of them, and started to think about where we should go should they begin to follow us more closely. All of a sudden I heard a reactive-dog owners worst nightmare: “He’s friendlyyyyyyy!” I turned around to actually see a reactive-dog owners worst nightmare: an off-leash dog literally flying full speed towards us. Thank goodness Johnnie was just exuberantly wanting to play and did not care in the slightest that this dog just ambushed us. In fact, that dog was rather sassy towards her (probably because she’s an energetic puppy), but his growling did not bother her. Anyone reading this who walks your dog off-leash, even in areas where you don’t think you’ll see many other dogs: please, PLEASE make sure your dog has a good recall! This could have ended so poorly. Thank goodness it did not! After she passed the off-leash dog situation with flying colors, I felt very confident that her and Charlie would hit it off no problem. Cue my guard being let down – uh oh. Charlie arrived and I asked his mom to take him around back so the dogs could meet and move to the backyard. Unfortunately Rojo was in his yard as well (we live next to each other, remember), had seen Charlie, and was making a huge, vocal fuss over it. This set Johnnie off, and the initial greeting with Charlie was about as far from polite as you can get. I’d like to pause here to talk about the one thing I want you to take away from this post: you can never, ever go too slow when introducing two dogs for the first time. It is so important to set both dogs up for success by making the intro as stress-free as possible. Face to face greetings are tough and unnatural to dogs, tight leashes increase stress and discomfort, and lots of changes and quick movements at once can be overwhelming. 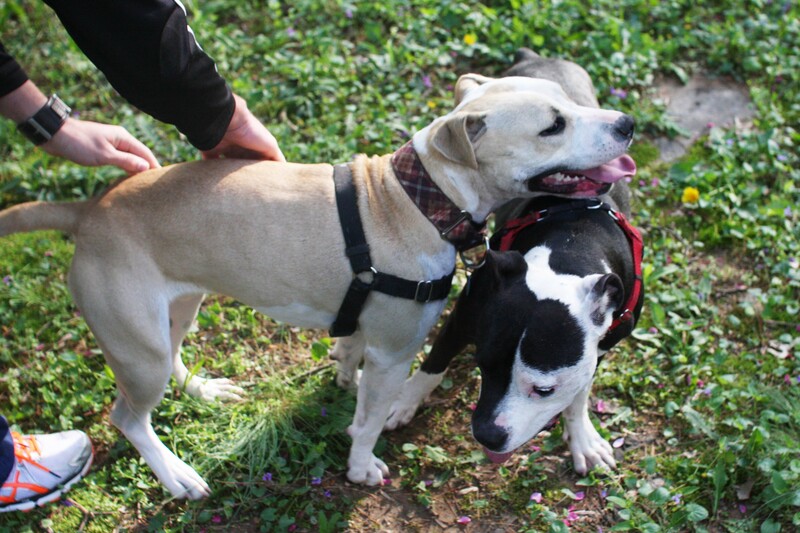 Keeping these factors in mind and aiming to make the meeting low key and relaxed will really help to increase the chances of the two dogs getting along. So, despite the fact that Johnnie was basically telling Charlie to F off in a very not nice way and Rojo was in the background egging her on, Charlie’s mom and I remained calm. We immediately removed the dogs from the stressful situation and walked to the road, which was much quieter. We began walking them up the street parallel to each other. This was huge in letting both dogs get comfortable in each other’s presence without the pressure of actually meeting. I continually asked Johnnie to check in and rewarded her with treats when she did, so she was much more willing to move her focus from Charlie to me. By the top of the street we had them walking almost touching each other without much fuss. Because things were calmer and they were more used to each other, Johnnie initiated actual play instead of just telling Charlie off. The difference between her body language was clear – her body was loose and relaxed, she was play bowing, she was not vocalizing – and Charlie responded well. It was time to let them play. We let them go in the backyard, leaving their leashes on initially in case we needed to pull them apart. It became clear pretty quickly though that the dogs were getting along beautifully. 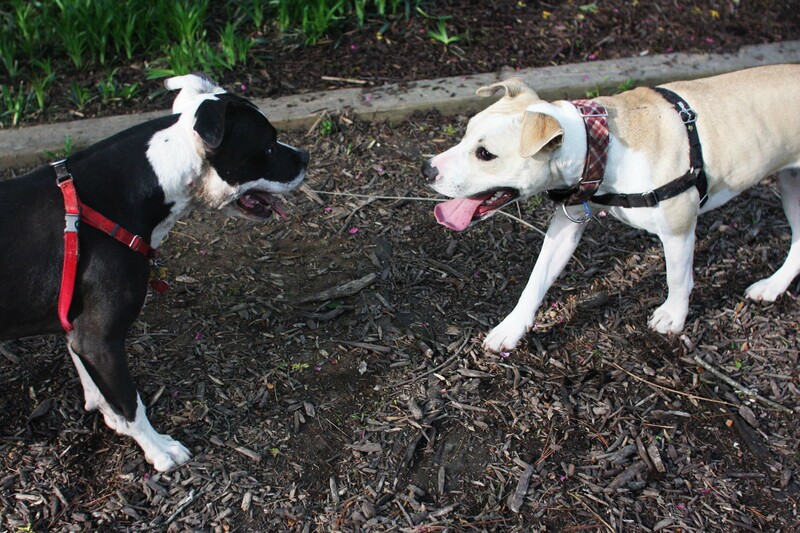 The play was pretty even between them with neither dog being too pushy towards the other. The play was also not getting either of them too worked up, which was what I was worried about. 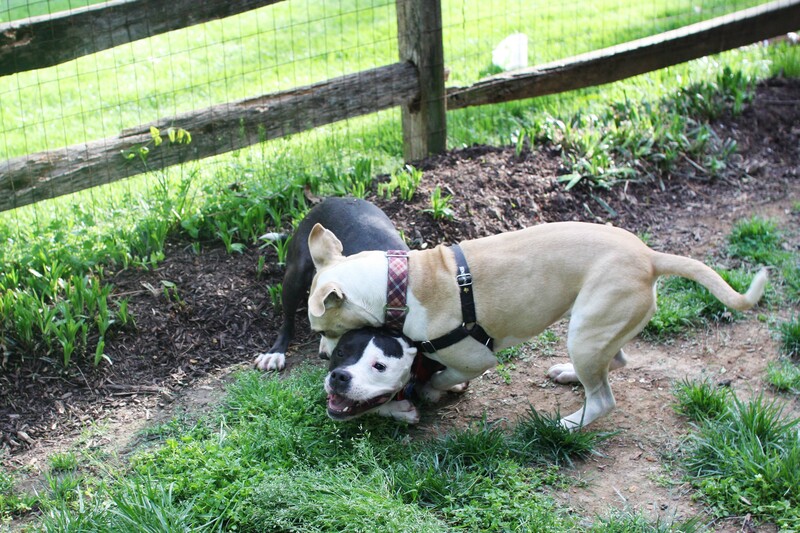 The tough thing about play between dogs is that it can go from really fun to really not fun in a matter of seconds. Charlie and Johnnie are actually two fabulous playmates. They have a similar rough and rowdy play style. Neither of them mind getting a little dirt or beat up. They don’t get offended when the other takes it a step too far (that’s what the humans are there to watch out for though). We were so happy to let these two play for nearly an hour! They both got so much energy out; it was really great. By the end of the session they were both able to just chill out in each other’s presence – a far cry from where they started. Because of the slow, patient introduction that lead to successful results, we can easily say Charlie is a pup we will add as a go-to friend for Johnnie. Thanks to Charlie and his mom for coming over and helping out with our learning experience – we had a blast! 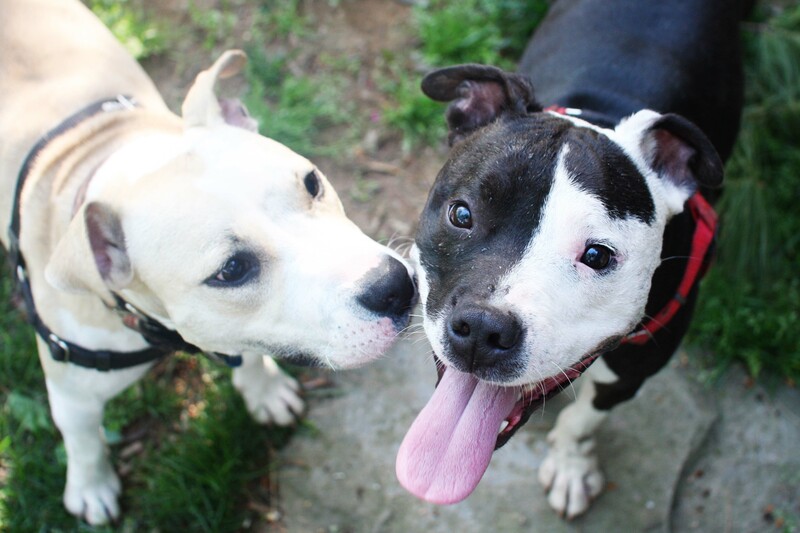 To adopt Johnnie Cash & help her find friends to play with, check out her Adopt Me page. 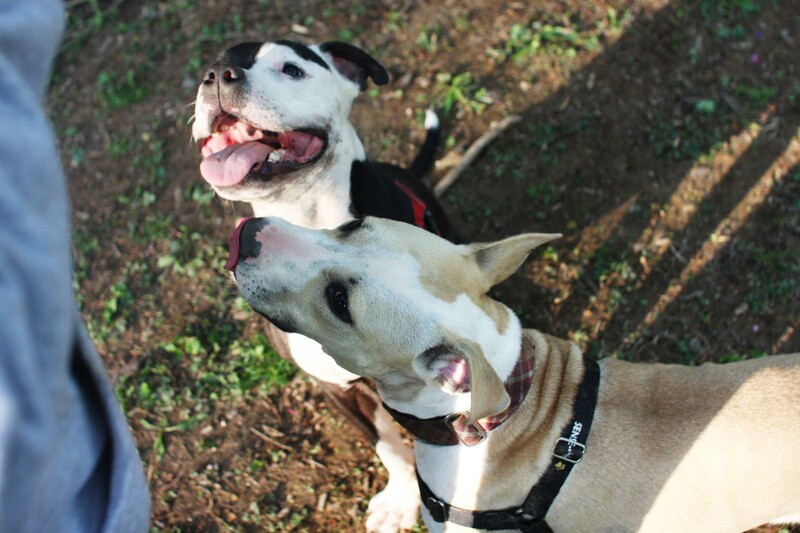 This entry was posted in Dog talk, Johnnie Cash, Photography, Uncategorized and tagged dog introductions, dog play behavior, dogs playing, foster failure, introducing new dogs, playdate, playgroups, two pit bulls playing. Bookmark the permalink. How wonderful! Glad you were able to defuse a dangerous situation and get them reintroduced. They look very happy together. I think it is so great that you took things so slowly, and were so successful! You may remember that it took us a full THREE MONTHS to integrate Georgia into our home with our other two dogs. It was oftentimes a stressful process for us humans, as we were constantly juggling dogs, but it has proven to be worth every second! The three dogs are now best friends, and just inseparable. I was also thinking as I was reading, about all of the dogs in the shelters who are evaluated with other dogs without being set up successfully like this. Not to mention, so many owners will surrender a dog to a shelter due to issues with other pets in the home. I so wish that slow introductions between dogs could become more commonplace, as I think it could save their lives! These two are too cute together – like a perfect matching couple! We hear ya on the reactive issues – it’s not easy taking them anywhere!! That looks like so much fun! I bet they zonked out afterward. People always comment on how well our two dogs get along and I’m constantly explaining that it’s because we went really slowly at first. We really took our time with introducing them and integrating Luna into our home and now they are the fantastic best friends. Just slowing it down really sets the dogs up for success. Congrats to Johnny for her non reactive response to the off leash dog. That has happened to us a few times and Foz is dog reactive ( he has a few dogs he likes and plays with) but when they aren’t part of his group he doesn’t like them. I don’ t like when they yell that they are friendly because I have to yell back that he isn’t and then there is trouble. I now take him very early in the morning where there are no people and dogs. Some people just don’t listen and are not nice when your dog is reacting to their dog and my dog is leashed. Glad to see Johnny playing with Charlie those were cute pics.